Hiking socks aren't just another gimmick to get more of your money. Wearing good quality socks while hiking will make your hike a much better experience and are an important piece of gear you should invest in. Hiking socks have evolved a lot in the past few years. Your old rag-wool wonders are now relics of the past. (I still have a few pair that I love, but don't wear hiking.) 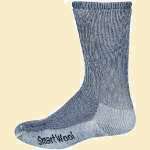 Now-a-days, socks are composite technical wonders, using different materials in different sections of the sock to best fulfill a job. Stronger fibers to resist abrasion are used in the toe and heel areas. 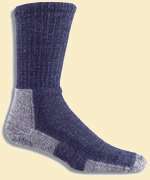 Elastic fibers hold the sock snug to the ankle and calf. 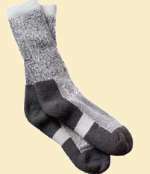 Wool and synthetic cushioning and moisture wicking fibers are used around the foot to help keep the foot dry and warm. A sock liner is a special kind of sock that creates an extra friction-reducing, moisture-wicking layer at a small price in money and extra weight. Never use cotton socks for hiking. Cotton absorbs moisture and takes forever to dry. Use wool to stay warm and still wick away moisture. Tend to be most expensive. Look for Merino Wool for softer, finer fibers. Use synthetics if your feet sweat a lot because they wick moisture away better than natural fibers. Turn the sock inside out and check the denseness of the fabric loops. Smaller, denser loops will hold up longer for cushioning and absorption. Thicker socks tend to wear longer. The thickness can also help improve the fit of a very slightly large boot. Or, a thicker pair of socks in the morning and a thinner pair after lunch when your feet have swelled a bit might be something to consider. Seams should be flat so they do not create more points of pressure on your foot. Socks should have elastic stretch so they hold to your foot and do not slip down into piles in your boot. The fit should be snug, but not tight. Any bagginess or extra length between heel and toe means its too big. Wash inside out so skin particles, salt, and sweat are washed away. Use just a small amount of fabric softener in the wash cycle to keep the socks soft. Air dry or remove from dryer before they are completely dry and allow to finally air dry for a fresher feel and safer dry. Commercial dryers are too hot and can shrink or ruin the socks. Love your site!!! Have been trying out a newer bamboo based sock. They wick well, seem to be durable, and are oh so soft on your feet. As of yet, I have never had a blister when hiking or backpacking. I use a 2 sock method and a comfy pair of well broken in, lightweight leather 3/4 height boot for general trips. You may be right about wool being the best but of course quite a few people are allergic to wool - what would you recommend in these circumstances? @Talk - Many people that feel they are allergic to wool actually just have a skin sensitivity to it. They can wear a polypropylene liner sock and see how that works for them. If actually allergic, then there are many synthetic socks that insulate and cushion similarly to wool - thorlo is a common brand. I have been told to wash walking socks as little as possible is this true, i mean after days of walking. @Jools - I wore lightweight trail shoes for the GC - no boots. I had no problems. The trail is not rocky and rough - it's well worn and dusty. Since your socks don't weigh much, maybe take both kinds you like and switch them up if needed. I just wore a single lightweight sock, nothing fancy. Can someone advise on the one or two sock method. @Mark - Sure enough. A liner sock helps with blisters, keeps feet cleaner, and allows you to replace the liner or outer sock or both. You can always take out the liner sock whenever you want, so using two socks adds only a tiny bit of weight to your pack. Two socks tend to be better for occasional hikers (that's most people) but not needed by people that constantly walk and have conditioned foot skin. @ Mark, I aways wear 2 socks in my boots when hiking, generally both wool but have just purchased some bamboo socks (wool 2nd pair) for an up coming cross country race. For me i get better blister protection, cushioning, better fit in my boots without doing them up too tight, more moisture absorbtion etc etc. Recommend that you try it. Hiking the Long Trail which gets extremely wet. Going with a Trail Running Shoe(Ultra Raptor-LaSportiva)...Suggestions on a Sock for this Trail? @Michael - I've had good luck with Darn Tough socks this past year. Merino wool socks in general work well in damp/wet conditions. A polypropylene liner sock inside your sock weighs very little and can be a big help in reducing friction, too. Am diabetic with mild diabetic neuropathy in my feet. Never had any major problems because I take good care. Worst thing that's ever occured are blisters from hiking. Headed to Costa Rica shortly. Will be rain forest hiking for about 4 days about 6 to 7 hours a day. Weather will be humid, warm and possibly rainy. Hiking will not be strenuous but long and more leisurely. Any suggestions on best socks given what I've described? Wigwams? Others? Thank You. Count me in as another 2 sock wearer, thin synthetic sock liner and a heavier wool hiking sock. I have both the REI brand and the Red Wing boots brand of wool sock and can't choose a winner, I like both equally. On my rookie hike I never even got a hot-spot while other rookies had blisters as big as quarters. I always wear bamboo socks - they are the besr. I can't wear wool or anything similar my feet burn. Great site, very helpful. My favourite combination is the Injinji Trail toe sock inside a Bamboo Treads Bamboo sock. I've had the latter for 6 years, and they're only slightly flattened. Bamboo's great for hot weather.